Veracitor – boosts performance and productivity. 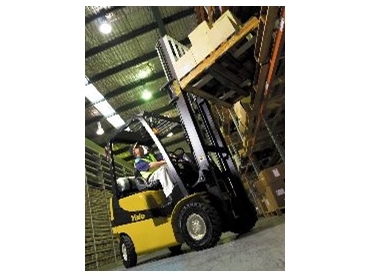 INTERNATIONAL forklift brand Yale will feature its most recently released Veracitor VX series of models on stand 1005 at Matex 2006 to be held at Sydney's Darling Harbour from May 30 to June 2. Yale has designed Veracitor to boost performance and productivity. Powerful engines provide improved performance characteristics such as greater fuel economy and faster acceleration for increased productivity. Veracitor's new models include wear and tear reduction features, smart transmissions, and easy to use servicing systems. * Optional Accutouch electro-hydraulics with automatic throttle response management automatically controls engine speed when the hydraulics is actuated. * The Yale Hi Vis mast gives greater visibility - three stage container masts offer better visibility than conventional two stage masts. * The optional rear drive handle (with horn button) is optimally placed on the rear overhead guard leg to enhance OH&S compliance and improve efficiency. * Veracitor (CSE) continuous stability enhancement enables the operator to travel on uneven with greater confidence and higher productivity. * Digital weight gauge available and integrated into the dash display. Part of Yale's total service proposition is to provide specially developed operator training programs, factory-conducted technician training, rental, lease or special finance options, as well as customer tailored service and maintenance programs.